In my second IoT project, I tackle feeding my cats by voice commands. My family owns three cats; for the most part, they are well behaved – unless they are hungry. When it’s time for them to eat, they get a little crazy – constantly meowing and running under/between our legs, or waking us up at night. We used to keep extra food in their dishes, but they would just overeat – resulting in cat throw-up (which, without fail, I seemed to step in every morning on my way to the kitchen). We’ve been living in this “claw-ful” situation for a few years, and never really considered resolving the problem. 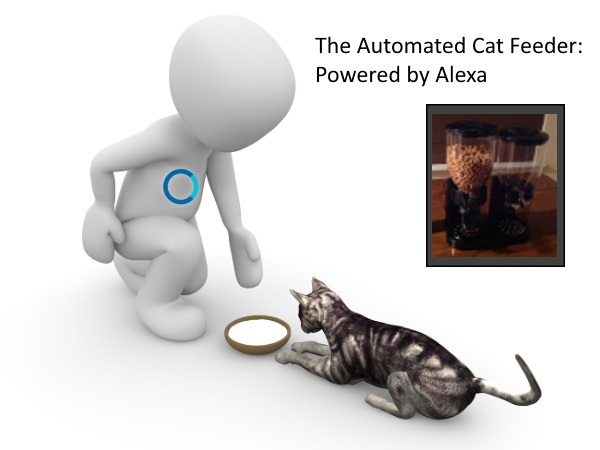 My oldest daughter suggested that we (and by we, she really meant me) build an automated cat feeder. I told her that I didn’t have the time to build one… but then, I figured, why not give it a try.